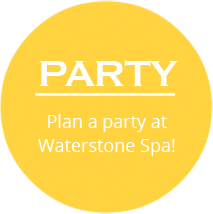 All Waterstone massage, of 60 minutes or more in duration, include heat packs for the back, warm towels for the face and feet, and time to relax in our steam and sauna. Our therapists are trained in individual specialties. If you’re interested, please see our website or ask our spa receptionist. Our signature full body wellness massage is a classic Swedish style, customized to fit your individual needs. Relaxes tight muscles and stimulates circulation. A therapeutic massage especially suited for strained or over worked muscles. Focused work, with our warming deep tissue lotion, helps to release tension, improve range of motion, and soothe away aches and pains. Our therapists will work with you to customize the treatment that’s right for you. Breathe deeply and let tensions fall away while enveloped in one of our beautifully aromatic and therapeutic essential oil blends. The aromas to which you are naturally drawn help balance your present state of being. Our blends include Balancing, Stress Relieving, Revitalizing and a specially formulated blend for the season. Our therapist’s soothing touch will help to ease muscle tension, increase circulation, and bring about an overall sense of well being. This massage is designed to nurture and honor the mother-to-be during this special time. We have supportive body cushions designed with the mother’s stability and comfort in mind. A perfect combination of expertly trained hands and heated basalt stones provide you with a deep sense of relaxation. The stone’s heat penetrates sore muscles, and helps to melt stress and tension. This treatment starts with slow, rhythmic dry brushing on the back, stimulating the lymphatic system and jump starting the healing of overworked back muscles. A mask of your choice, either rose clay or seaweed, is applied, followed by soothing heat packs. While you rest, your scalp and feet are massaged to bring about an overall sense of calm and well being. Warm steamed towels remove the mask and ready your back for a restorative, neck, back and shoulder massage. Heated neck wraps, essential oil-infused lotion and steamed towels enhance a traditional 30-minute reflexology treatment with spa luxury. Wonderful as both a stand-alone treatment or as an add-on to an existing treatment.